So; Streaming is something I've been getting into recently. And since I'm currently playing through the Fantasy Maiden Wars series; I thought I'd stream that. I'm playing through the Marisa route; and attempting to get all the Bonus Objectives when I can. If anyone wants to watch me play a Touhou-themed SRPG; feel free to join in. I'll be talking in the chat. It's raining, it's pouring, it's a Sunday and other people in my household are working right now. So I'll actually be able to talk instead of typing to people! Gonna be playing more Fantasy Maiden Wars; from Mission 7 onwards. Streaming some more Fantasy Maiden Wars. Starting with a re-try of Mission 10. Not because I failed it but because I want to try and get the bonus condition and show off an Easter Egg. Edit: Mission - Master Spark Yuuka succeeded. Tried Mission 11 but the game crashed just before I was going to take a safety save and I don't have time to retry it right now. Going back to more FMW. We're now on Mission 11, against... well. the entire SDM bar Flandre. I'll probobly be doing frequent safety quicksaves because I don't want the game freezeing up halfway through the mission and losing progress again because it's a long mission. Edit: Failed Mission 11, but discovered that when you Game Over you keep your EXP. Which is good in the event it's a case of 'You're underleveled'. Especially when I've had most of the bonus objectives done and killed every enemy except Mission 3 Alice and I still seem to be lacking a bit of power. The problem was I lost Keine early on so lost 3 uses of Trust; and lost a few too many characters before that. Remilia is a long fight; and she regenerates every turn so it's a DPS check of sorts, and her 3rd Phase has a MAP attack so you need to kill it really; really fast. That's a bit hard to do while still having enough in the tank for the final phase with only Alice; Marisa; Reimu and Daiyousei. EDIT2: Some more Mission 11 attempts! No talking tho; just chat. 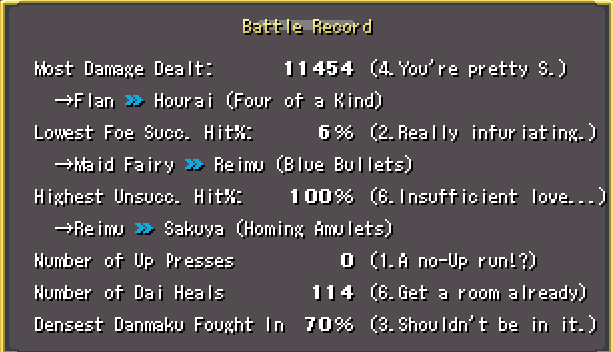 EDIT3: Got within 2000 HP of winning; but Reimu got shot down in Remilia's 2nd phase on a sub 20% chance to hit OHKO; depriveing me of a reliable damage source and Fantasy Seal. That would have made the difference. Or Keine hitting one of her Headbutts. Right; so I streamed again this morning [I'm not bumping EVERY stream] and beat Mission 11 and Mission 12. So now we're going oto Mission 13; 14 and 15. If all goes well; I'll finish the Marisa Route of FMW S tonight. If all goes badly? Well... let's just say I hope you like U.N Owen remixes. EDIT: Beat Missions 13, 14 and 15 first try! Now Marisa Route of FMW- Scarlet is completed; next time; we'll be moving onto the next game! AND I HAVE NO CLUE WHAT HAPPENS FROM THIS POINT ON. Doing a morning stream. Moving onto the 2nd game now with the Marisa Route. Edit: What's the worst kind of freeze? The kind that happens in the post-mission dialogue just before you can save! And the crash has been fixed! I'll admit; I played 2 missions in advance JUST to be sure of it. But I still have my save from just before I finished off the Akis so you don't miss anything! Also; I've been hearing Normal Node; while fine for Scarlet is pretty easy onwards. But; the catch is that you can't change difficulty once you start. So what I might do if I find the 2nd game too easy is; after clearing, go back so Scarlet and clear that on Reimu Hard Mode. That way I get to see the other half of the storyline as well. No way am I playing Lunatic; I've heard that basically requires resetting for good RNG. Onward with the Marisa Route! The mission is 'to be flashy and make a distraction'. No wonder that's Marisa's job here. EDIT: Downed Nitori and Aya. The end of Aya's mission was the most pathetic ending ever. Aya couldn't do real damage because she'd run out of MP; it was the last turn of the fight, and she had 300 HP. Goin online for a late stream tonight! Time to take on Sanae, and possibly Kanako after! And final phase she just starts spamming MAP attacks while casting every single spirit on herself [This oneshot multiple characters, including Reimu].